The ability to estimate, interpret, and manipulate data is an essential skill. 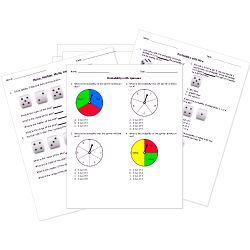 Strengthen student understanding of probability and statistics concepts with these printables. Don't see a printable you need? Use our Test Maker™ to create your own printable that fits your needs. Browse statistics and probability questions or use our advanced search to find existing questions while filtering by grade levels and keywords. You can also create your own questions. Mean, Median, and Mode Word Problems new!